We have an adversary! He’s a fallen angel. This fallen angel is called “Satan” 53 times in Scripture. It is the favorite name of the devil throughout the entire Bible. It is also his proper name. Thus when Jesus rebuked the devil when he had finished tempting Him, He used the devil’s proper name. He said, “Begone, Satan!” (Matthew 4:10). 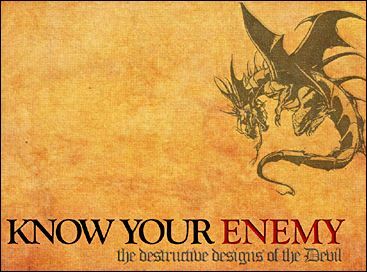 The word that is translated as “Satan” in the Hebrew and Greek actually means “adversary.” It refers to someone who is your enemy; someone who has it in for you. Remember those days in junior high when the school bully picked on you? Or maybe there was a girl who would gossip about you. You had an “adversary”—someone against you. He is the one “hell-bent” (No pun) on you suffering in some way. We often think our adversaries are human. They are not. Surely we’ve all had human enemies in life that we knew wanted to hurt us in some way. But the truth is these people are simply instruments in Satan’s hands. He is using them to cause us harm. They are flesh and flood, just like us. They have hearts and livers, lungs and skin just like we do. They bleed like we do. They suffer physically, emotionally and spiritually just like we do. Even though they may harm us they are not our enemy. Satan is our adversary. He is behind it all! I need not go too far in the Scriptures to demonstrate that. The source of all of Job’s suffering at the hands of others was Satan. Peter’s denouncement of Jesus’ plans was inspired by Satan. The false accusations against Christ were also inspired by Satan. When others betray us, as Judas betrayed Jesus, it’s Satan that puts it in their hearts. One of the more powerful weapons in Satan’s arsenal is the confusion he creates in us over “who” our enemy really is. His desire is for us to focus on the instrument of his wrath (people! ), and therefore accelerate our problems with each other. Please understand that this is the whole message of Jesus’ instructions to us to “turn the other cheek.” Even Old Testament biblical wisdom tells us that “A soft answer turns away wrath, but a harsh word stirs up anger” (Proverbs 15:1). Wars and rumors of wars and fights and strife in churches and in families are all part of his plan to destroy the joy and purpose of God in our lives. God’s purpose is to “prosper us, not to harm us: to give is hope and a future” (Jeremiah 29:11). But Satan’s purpose is to kill, steal, and destroy. Others that end up being instruments in Satan’s hands may do us harm. But never lose sight of the reality of who our true adversary is.